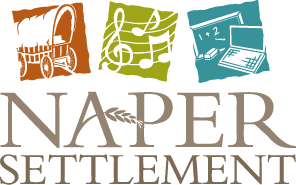 Naper Settlement Museum - Official Website - Naperville Plays! Home > Programs > Public Programs > Naperville Plays! Naperville residents (with ID) and members are free. DuPage Children's Museum Members receive free admission to the level of their membership, must have membership card present. Join us at Naper Settlement for this fun and educational program themed around “On the Farm.” Families will quadruple their fun with hands-on craft activities along with storytelling provided in partnership by the DuPage Children’s Museum, Naper Settlement, Knoch Knolls Nature Center and the Naperville Public Library. Visitors will quadruple their fun in this partnership of programming with hands-on craft activities along with storytelling provided by the DuPage Children’s Museum, Naper Settlement, Knoch Knolls Nature Center and the Naperville Public Library. Held at the Knoch Knolls Nature Center, 320 Knoch Knolls Road, Naperville, IL. Visitors will quadruple their fun in this partnership of programming with hands-on craft activities along with storytelling provided by the DuPage Children’s Museum, Naper Settlement, Knoch Knolls Nature Center and the Naperville Public Library. Free admission. Held at Nichols Library.